Last Sunday we attended a dharma teaching at Green Gulch Farm, on the western flanks of Mount Tamalpais, above Muir Beach. It was the kind of morning for which this part of California is famous: foggy and cool with sudden glittering glimpses of ocean or mountain that as quickly disappear back into the magician’s hand. After scurrying down the eucalyptus-buttressed driveway, we arrived at the temple late and at the wrong door. The temple was packed and listening to the robed priest read a children’s story to perhaps twenty well-behaved but wiggly children. Once the children were sent off to their own separate programing, the priest began his teaching in earnest, an hour-long disquisition on the relationship between labor (it was Labor Day weekend, after all) and Zen practice. He read two poems by W. B. Yeats, one by Patrick Kavanagh, and referenced Shakespeare and Northrop Frye. I would bet that his radio is usually set on the local NPR station, and that he was looking forward, as I was, to reading the Sunday New York Times that afternoon. When Martin and I got to the Times-reading phase of our own Sunday liturgy, I read a beautiful essay in the book review entitled “Articles of Faith” by Dara Horn, in which she muses on the easy confluence of contemporary Jewish fiction, even if it’s overtly non-religious, with ancient questions of faith. She contrasts this Jewish feast with the slim pickings on the post-Christian literary table: “Whither the Flannery O’Connors of yesteryear? Marilynne Robinson can’t do this all by herself!” Because Judaism is a faith based on the concept of preserving memory, she asserts a peculiar affinity between Judaism and fiction-writing, “a mystical and irrational belief in a type of memory no neurologist would recognize, a phenomenon both uncanny and eternal,” a conviction that “time can be stopped, that somewhere, whether on our notebooks… or our spirits, everything is perfectly preserved and recorded, ready to return to life.” The essay ends with a call to listen to and create the stories that give a deep anchorage in history and a shapely hope to our personal and communal lives, even as the anchorage has made clear the murderous powers in which we swim. All right, I thought, I guess I’m Buddhist and Jewish today. Does that mean I’m not a Christian? Oh, dear. And on a Sunday. Being in California, particularly in Point Reyes Station, leaves me a little disoriented, especially since I come from a state that has ignored virtually every vote I’ve cast in the past twenty years. Martin and I are in like-minded company here: virtually every voice loudly proclaims with gusto the gospel of sustainable and local. We’ve driven north to Bodega Bay and south to Mill Valley and in fifty miles passed not one fast-food joint. Cattle are vital to the local economy and yet are grazed and raised humanely on federal lands. Signs supporting the Marin Agricultural Land Trust—which protects about half of Marin County’s agricultural land from development—appear in almost every eatery with monotonous, almost sinister, regularity: could you end up in Tomales Bay wearing sustainably produced, free-trade cement shoes if you try to run a restaurant without supporting MALT? Could I as easily be a Buddhist or a Jew as a Christian? A northern Californian as a Texan? The answer is probably yes, but I’m not. At some point in asserting an identity, in describing your part in the created order—something most Americans and maybe most post-Enlightenment people feel compelled to do—some sifting is necessary: this and not that. So I’m wondering why or how I’m a Christian. (Figuring out why or how I’m a Texan is probably too complicated an issue to tackle here.) The Nicene Creed seems as good a place to start as any. It’s quite possible that the mere mention of those words—Nicene Creed—will start the sifting process in some readers: here’s my stop! It certainly would have stopped me twenty years ago. I used to hate the creed, and I hated it even before I started going to church. How could you not hate something that required you to believe a dozen impossible things before breakfast? And not just impossible but downright unethical and sometimes just plain silly? The bit about the Spirit proceeding from the Father and the Son always makes me think about opening a collapsible telescope. When we first started going to church, not so many years ago, saying the creed could ruin the whole service for me by starting an avalanche of arguments in my head that must have been audible at least to the people sitting next to me. After years of saying and hating it, I began to say it with a few grudging assents. I was eventually surprised that immediately after the agitating “Father Almighty,” God’s next attribute was surprisingly democratic: maker. I’ve known lots of makers: hat-makers, bread-makers, policy-makers, cheese-makers (this is the home of Cowgirl Creamery, after all), and homemakers. Okay, I could say “maker.” I came to appreciate that creation included things both seen and unseen. Whether I believed it or not, I loved the effect of the introduction to Jesus: “eternally begotten of the Father, God from God, Light from Light, true God from true God, begotten not made, of one being with the Father.” I didn’t know what it meant (still don’t), but it was like entering a dense fog with a deep gong sounding, and it was followed by the bright iambic rhythm of “through him all things were made.” Okay. I could say that. I can now say almost all of the creed, even the Father Almighty part. I’ve had a father. I’m married to a father. I’m the mother of someone I hope will be a father some day. I know a lot of fathers and with all my heart I believe—credo—in the power and tenderness and explosive energy that seems to be bundled with fatherhood and that is, at least in a post-Jungian world, no longer the exclusive domain of men. I can also say what kind of fatherhood I don’t believe in, to which I emphatically do not give my heart. 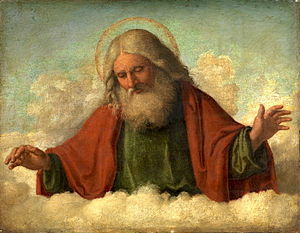 Nor do I imagine that calling God “Father” can possibly limit what I understand God to be, what the prophets and saints imagined and imagine and will imagine God to be. If in a moment of Christmas amazement I address the infant Jesus as “Sweet Potato,” as I have addressed each of my children, I don’t really expect a creedal formula to arise, but I glimpse the power that binds God and creation. I can say that with all my heart. who forced a crisis in those who met him. He died in agony—deserted, betrayed, true. everyone in time and space to join him. and all that is, has been, will be. all patient love, all improbable forgiveness. and when I don’t think too hard. I believe this whenever friends and strangers gather for a meal. but I know I must believe or wither. My identity as a Christian (and perhaps as a Texan) has taken—and continues to take—a series of unexpected turns. Many of the paths on which I have found myself peter out, but some of them allow me to move ahead. Since Martin and I are in this beautiful place to hike, I can’t help but imagine this process as walking in a wild place with a map that is useful in a general sort of way—you know what direction you’re headed in, where significant landmarks are in relation to each other—but less helpful when it comes to the specifics of navigation. The trail becomes fainter the farther you go, more like a deer trail, and suddenly you find yourself walking in high shrubs or reeds or thick understory. 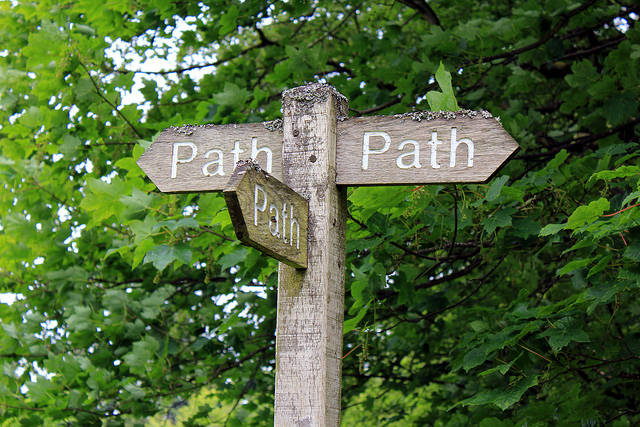 Several paths, equally well trodden, present themselves to you. You take one, puffing through the scratchy gorse, wishing you’d worn long pants, and swatting at mosquitoes. The trail becomes available only to those walkers with four feet. You swear and head back, hoping you’re actually on the main trail. You are, but it divides again, and all of a sudden the trail is nothing but thick impassable mud. You hear running water and know from the map that the trail is supposed to be near a creek. So you take off through the chaparral or whatever this damn stuff is and tear your shorts on a branch in an annoyingly conspicuous place. You feel sure that a trail will appear somewhere if you just get a little higher up. And all of a sudden, your partner now muttering unattractive observations about your sense of direction, you glimpse the quiet shining lake. You’re still not sure where the trail is, but the lake is right there. This entry was posted in More and tagged Buddhism, Christianity, Judaism, Marin County, Nicene Creed, Point Reyes National Seashore, Seton Cove, W. B. Yeats. Bookmark the permalink. Thank you for your version of the creed! The problem I have is the premise that “believing” this or that is what makes us Christian. Could we consider instead how we respond to each other, or to any other? But I DO prefer to SING it than SAY it—as part of the liturgy, I can love it! Thanks for converting my Friday to a Niceness Friday! I love the way you think, reason all this stuff out, & then put it all into prose. One of the many reasons I love sitting next to you in the pew at church! As a well-seasoned bureaucrat by trade, I find the Nicene Creed amusing. It demonstrates that the ability of a committee to dilute a direct statement is gratifyingly ancient. When I want the articles of faith in a stronger brew, I read the Apostles’ Creed. There is (or was) a large framed version of the Nicene Creed hanging in Rather House at the Seminary of the Southwest in Austin. I think your version should be framed and hung there also. Believe me, most querida amiga, it is going in my daily devotional basket. How I love you! Heather, thank you for your own creed. I’m re-reading tomorrow morning, early, when I’m receptive to the non-daily. This could become my daily, though. I love your creed. What a wonderful exercise to play with what is most important to our belief and our faith as Christians. Thank you for sharing your heart and your many gifts with me. All my love. In your waning days, I’ve been going back through these blog entries, savoring them, so glad to have known you for so long. Thank you for writing everything you’ve ever written here. Every time I wonder how in the hell any of us will ever live without your physical body on this earth, I will come here and find the inspiration to do my best to carry your beautiful voice and chewy ideas forward. I love you Heather Catto Kohout.